Right-ho. Time to get more graphic than foodie for a sec so hold in there. 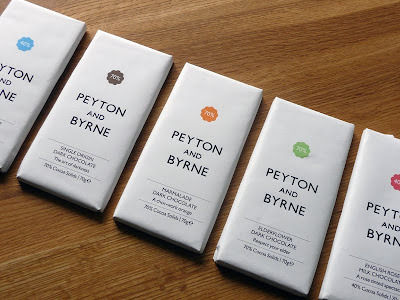 The Peyton and Byrne brand design is one of my absolute favourites by the rather marvelous Farrow agency. As a designer it is all too tempting to over design, and simplicity, believe it or not, is a very hard and gutsy thing to achieve. Farrow have hit the nail on the head with this brand and I love, love, love it. 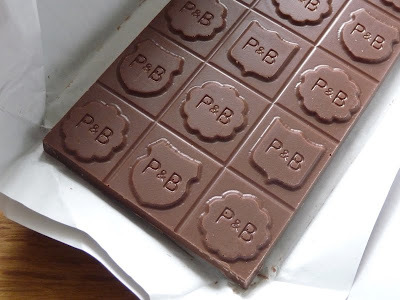 Chocolate is luxury and the experience always begins with the packaging. Look at how fervently Charlie from Chocolate Factory fame unwraps his precious bars. Peyton and Byrne is refreshingly void of the typical gold and flourishes, opting for a plain, uncoated white paper, seemingly hand-wrapped and casual (my mum would say sloppy) with simple black lettering and a single colour to differentiate the bars and to hint at the flavours. And the flavours don't get more British than this. Cornish sea salt, English Rose, Marmalade, Elderflower and Toffee which vary between 40 and 70% cocoa solids. So were they any cop? I was lucky to have a stack of them to try. The Cornish Sea Salt (Milk chocolate) was probably my favourite, just because it was so interesting and a little bit different. All of the flavours were incredibly subtle and most of the flavour was experienced as an after taste. Not necessarily a bad thing. The salt was only noticeable at the end as little sharp tinges on the tongue. Lovely. The Marmalade (dark) was a classic orange-chocolate flavour, just a bit more grown up and the Single Origin Dark Chocolate was rich, deep and good quality. I do like rose chocolate but would have preferred this milk chocolate version to have been a bit stronger. Not everyone likes perfumy food but I like it when rose flavoured chocolate seems to coat your mouth in richness. The Elderflower (dark), which I though would be my favourite, was surprisingly my least-favourite. To me it just had a washing-up after taste with no sweetness. That single blip aside I would much rather get a stack of these than a chocolate egg this Easter. I received these complimentary bars for review.